In one of Europe's most romantic and vibrant cities, the "Hilton Prague" is conveniently located on the right bank of the River Vltava. Within walking distance are many historical sights and local attractions, the finest shops and a lively night scene. "Hilton Prague" features 788 bedrooms offering either an exterior view looking out over Prague Castle or an interior view down onto the transparent glass roof of the impressive atrium lobby. The hotel has 31 suites consisting of 1 Presidential Suite (with sauna and jacuzzi), 3 Apartments, 19 Executive Suites (1 bedroom) and 8 Junior Suites. 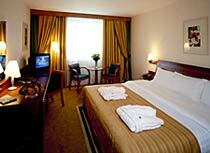 All suites are located on the executive floors, which are the top two floors of the hotel. Included as part of the Executive Floor package is private check-in / check-out, access to the Clubroom offering complimentary continental breakfast, afternoon tea, evening cocktails, hors d'oeuvres and refreshments, international newspapers and magazines throughout the day. For leisure and relaxation, there is the "Cybex Health Club & Spa", the largest health club in town, offering a swimming pool, dry and wet sauna, solarium, a gym, an aerobics room, a private training room and a squash court as well as a health bar, treatment room and beauty salon. 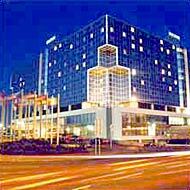 The "Hilton" has three restaurants: the "Atrium", a buffet restaurant, "Citrus", for casual dining, and "Café Bistro", open 24 hours a day.